Colonizing Earth-like heavenly bodies: science fiction writers have mused about it. Heck, even Stephen Hawking endorses it. 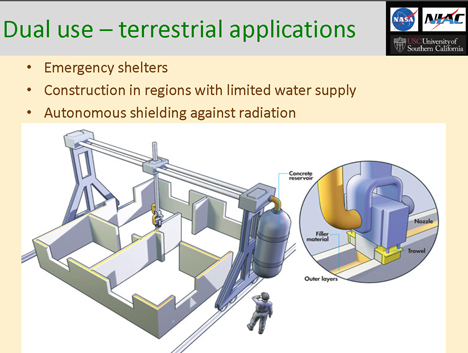 Now, NASA is using revolutionary technology to create buildings on the moon that may one day be habitable by humans. The technology was created by USC professor Dr. Berokh Khoshnevis. His 3D-printing robots use a method known as contour crafting. This technique uses the massive printers to layer concrete, as well as create electrical wiring, plumbing and other household necessities. It’s apparently impressive enough to get Khoshnevis a grant from NASA to work on producing housing and other structures on the moon and other Earth-like planets. Khoshnevis’ robots are currently controlled by a complicated computerized gantry system. They’ve already produced six-foot building segments (here on Earth, that is), and if properly streamlined, they could become an affordable way to produce low-rent housing. 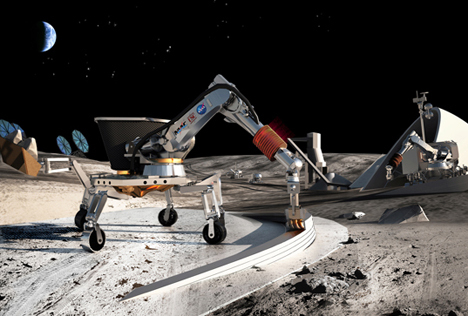 NASA’s grant shows their support for using the system to build on a possibly-colonized moon. See more in Robotics or under Technology. February, 2014.